Cycling home last week, I stopped at a junction just off Vauxhall gyratory (corner South Lambeth Road, Fentiman Road). This is a cross-roads with no pedestrian green phase. Cars race off the Vauxhall gyratory down South Lambeth Road and it's a hairy place for everyone who's on foot on on a bike. What happened in this case is the cyclist seems to have been turning right. A car coming the opposite way sped to beat the lights (the cyclist was turning on green) and hit the cyclist, sending the guy flying, then careered down the road a bit and took out some signposts on the way. Over the last couple of years, I've seen the traffic lights here hit quite a few times. I've only seen one car upside down so far but one other ploughed into the pavement. Two pedestrians have been killed on this same junction in the last five years alone. And why? Because this perfectly simple cross-roads is designed to maximise the number of cars racing to or from Vauxhall gyratory. That's why there isn't any pedestrian phase on the lights and you can cross the road here but only when cars have a green light as well. That would be fine if cars gave way to pedestrians crossing. But they don't, they just honk you out the way. 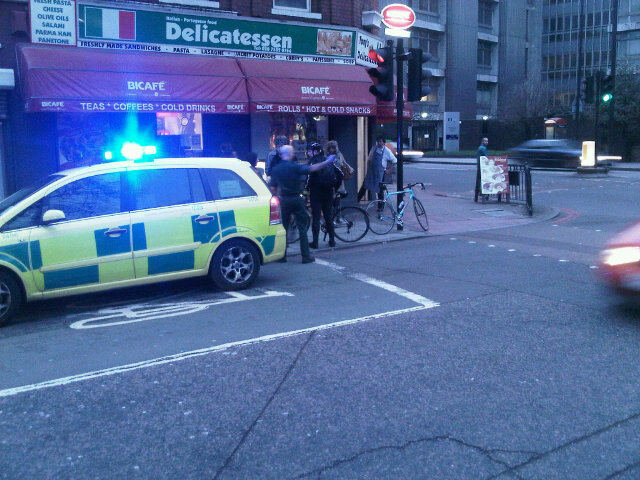 Last night, another cyclist was sent flying from her bike on Vauxhall gyratory. Details are a bit sketchy but the woman seems to have been very badly hurt. Two similar Jaguar cars were stopped near the scene. One observer wondered if they had been racing around the gyratory. It wouldn't surprise me. You see people racing their cars around here every time the lights change. It's something to do with the way the road is laid out. The road design positively encourages people to floor it around the gyratory, which even has reinforced metal crash barriers around it. Not just a fence, real double-height crash barriers on top of extra thick brick barricades. These are not an accident, I think they are by design. When I came across the collision pictured above, I talked with number of the witnesses. A woman who lives in the same street came along to enquire what was going on. 'You see cyclists jumping all these red lights' she said. Yes, you do see some cyclists jumping the red lights. But at this junction in particular, red light jumping by motorists is endemic. Which makes it fairly challenging to cross the road (which, incidentally is right next to a park and to a children's day care centre). And in the neighbouring area, in and around Vauxhall gyratory, fast accelerating, excessive speeding and intimidating car use is the norm. So it's curious that the first thought of a local resident is to blame all cyclists for jumping all red lights, upon seeing a person lying injured on the pavement and a smashed-up car. My feeling about Vauxhall is that the design of the thing blights a whole neighbourhood. People come off the gyratory thinking they're in some game of Super Mario Bros (apologies to the licence holders). They let rip as they come off the gyratory and speed down the nearby roads. And the nearby roads are designed to encourage them to do that. The roads are designed with wide, sweeping curves and pedestrian crossings are kept to a minimum (try walking from Tesco on Kennington Lane and crossing the road here for example. You can't cross in any direction at this point on the gyratory because you might upset the traffic). Last week, two coroners – one in West Yorkshire, the other in Northamptonshire – who presided over separate cases involving the deaths of cyclists have called on highway authorities to amend road layouts that they believe were a factor in those riders losing their lives. My own view is that the road layout is a factor in the high number of deaths and serious injuries at Vauxhall Cross. Last week, the leader of Lambeth council committed to "create a proper town centre in Vauxhall and remove the physical barriers, like the gyratory, that make this difficult". Unsurprisingly, Boris Johnson thinks keeping the traffic flowing is more important. He calls this policy: 'proposals to improve Vauxhall gyratory for all road users'. Looking at the collision data, I'd argue that Vauxhall Cross is a place that kills and maims predominantly pedestrians and cyclists. Why isn't it being redesigned in their benefit, not in favour of 'all' road users? Let's look forward to adding more names to the list of people killed and seriously injured at Vauxhall then. I have to admit I do quite enjoy racing round Vauxhall, although I do it on my bike ;-) It might have something to do with the buzz I get from nailing it off the bridge and through the chicane under the bridge as I also head off down past this junction. I remember passing this on Friday. Saw the ambulance and the bike next to it and my heart sank. I did once line up alongside an older gent on a folder at the lights where it splits towards E&C who commented he "hated this bit"
I've captured a few near left hooks at this junction, including one from a fellow cyclist who completely failed to indicate before cutting across in front of another rider. Whilst I'm more then happy/confident/quick/stupid (delete as appropriate!) enough to navigate this urban motorway it is by no means something I'd expect a new or even novice rider to tackle. I've had a couple of near misses on this junction. Everytime it's a car speeding past me to beat the lights and turn left. I drive here quite regularly and it's designed to allow you to go fast. I quite enjoy it but I make myself go slow as I also cycle and I want to be a responsible car driver. Unfortunately many people aren't so responsible, and lots more don't know what they are doing and drive badly as they try to work out which lane to be in. It's disgraceful that such a junction is allowed in a city that has more cyclists and pedestrians that car drivers. It appears that a minority of car drivers can dominate a whole city, what did we do as car drivers to achieve this powerful status as I'd like to replicate it for gay marriage. It is a seriously horrible place to go round.